Pours to a murky, dirty orange. I can't see a thing through this beer no matter what light source I hold it up to. The initial aroma I picked up was a heavy apple juice presence. A lot of earthy hops are there too. I hate to say it, but the 9.00% is noticeable, which is a bit if a letdown. We switch from apple juice to orange juice on the taste. That's not to say the apple is gone because it is also there. Pleasantly fruity with those herbal/floral notes. However, the alcohol strikes again and the finish does have a bit of a sting to it. I'm glad to report that while alcohol is on the taste, it is not overpowering nor is it the dominant flavor, so it still goes down easy. There isn't a lot of carbonation and it does come up a bit flat, but the mouthfeel isn't too tick or thin. The alcohol presence on the smell and taste was initially a deterrent, but I enjoyed this offering from Blatant Beer. 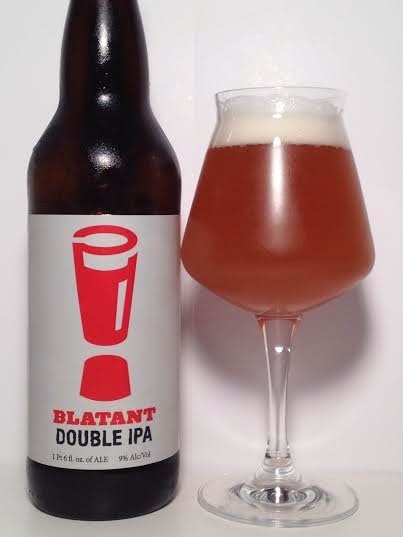 There is enough fruity flavors to combat the alcohol to make a good experience, but overall there are so many other beers of this style that do a better job of masking the alcohol presence while making the hops and juices pop.